The human body is designed to move, and it is also designed to take a load off from time to time by sitting down. But when time spent off your feet by far exceeds your time spent in motion, it can lead to negative consequences that speed up aging and wreck your health. In today’s age of robotics and technology, occupational culture is shifting rapidly to physically passive work that engages your mind but neglects your body. More and more, people spend their workdays in a seated position for hours on end. We even eat meals at our workstations. Add to that time spent commuting, and “down” time at home as you unwind before bed, and the sum total of time spent daily being physically active shrinks to mere minutes. Sitting in itself seems harmless enough, and some might even argue that it is safer than, say, operating a jackhammer. But new research reveals that excessive sitting is more toxic than smoking cigarettes, affecting both your body and your mind. Moreover, excessive sitting is becoming globally pandemic, leading toward a worldwide health crisis. When standing with perfectly aligned posture, there is minimal stress to the body’s musculoskeletal structures — imagine soldiers standing at attention for hours. But when you deviate from upright posture to sitting for prolonged periods of time, your muscles and joints work overtime. In a recent study, Baker et al. (2018) wanted to quantify the impact of long-term sitting on participants’ minds and bodies. 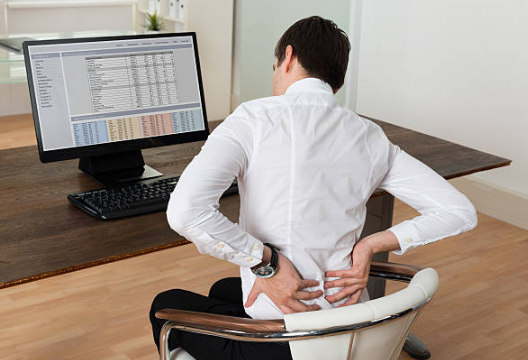 They found that after two hours of seated computer work, discomfort increased in all areas of the body, particularly in the low back, hips and pelvis. Additionally, they found undesirable changes in low back angle and increased instability in the pelvic region, conditions associated with low back pain. Inactivity can lead to disability as you age, and increase your risk of falls and injury. Physical activity has long been associated with reduced risk of cardiovascular disease (CVD) and all causes of premature death, including hypertension, diabetes and some cancers. In a recent literature review, Owen et al. (2010) noted that even if adults exercise enough to satisfy physical activity guidelines, prolonged sitting can still undermine metabolic health and increase the risk of early death. Not only is excessive sitting hard on your body, but it can affect your mind as well, making you less productive at work. The afore-mentioned study by Baker et al. (2018) found that prolonged sitting elicited a decline in creative problem solving. Another study conducted at UCLA took brain scans of the medial temporal lobes (MTLs) of older adults. The MTL is an area of the brain where new memories are formed. The research team found lack of physical activity to be a significant predictor of MTL thinning, considered to be a precursor to dementia and cognitive decline in adults. They noted that even large amounts of physical activity were insufficient to make up for the negative effects of prolonged sitting. Drive less: Walking, cycling or taking public transport are all ways to reduce the stress of commuting while increasing your daily activity levels. Take mini activity breaks: Every 30 minutes or so, get up from your work space and stretch, walk around, climb stairs, or do squats or other exercises. Commit to regular exercise. Hire a trainer, join a class or form a walking group with friends or coworkers. Exercise at least 30 minutes, 5-7 days per week. Spend at least some time standing throughout the day. Even Hemingway wrote standing up. Choose physically active leisure time activities. Go to a park or zoo, visit a trampoline or climbing gym, hike, bike, skate, swim…just keep moving! Eat fresh food, and drink plenty of water. Nutrition is important for health too! Dr. Kalika is a doctor specializing in Chiropractic medicine and sports medicine rehabilitation. He is a speaker and co-author and has been successfully practicing medicine in his midtown clinic: New York Dynamic Neuromuscular Rehabilitation & Physical Therapy since 2011. The practice is established as a gait and running analysis clinic, and focused in sports injury prevention, back, hip, knee and shoulder pain. He completed his post graduate education in Motol and Charles University Hospital under world renowned prof. Karel Lewit MD. and prof. Vladimir Janda MD. Dr. Kalika is the first practitioner on the East Coast of the U.S. to treat patients with “Dynamic Neuromuscular Stabilization” and “Voijta therapy” (techniques brought from Europe to the Heart of New York City). He has recently brought another breakthrough method: Ultrasound Guided Dry Needling into his practice. He has treated celebrity athletes, including Olympic gold medalists and NFL football players. In order to cater to each person’s needs he develops unique treatment programs utilizing combination of meticulous clinical skills and research grade technology. Dr. Kalika loves what he does, and his passion continues outside the clinic where he attends speaker conferences for teaching new doctors, co-authoring a medical textbook, and researching new treatment methods in case studies. Beyond practicing medicine he enjoys attending sporting events with his children and long walks in local parks with his dog.